Let me begin by congratulating you, Mr. President, on your election to the President of the Sixty-sixth session of the United Nations General Assembly. I also take this opportunity to sincerely thank the outgoing President, His Excellency Mr. Joseph Deiss, for having successfully steered the Sixty-fifth session. Let me also express our sincere appreciation to His Excellency Mr. Ban Ki-moon, Secretary-General of the United Nations for strong commitment and dedication with which he has been serving the United Nations. We wish him further success in his second term. Nepal warmly welcomes the Republic of South Sudan as a newest member of the United Nations. In recent years, a momentous transformation is taking place in Nepal. After a long and persistent struggle, a feudalistic and autocratic monarchy has been abolished. We have entered into a new historic era with the creation of a new federal democratic republic of Nepal. Today, the new state apparatus is striving to take into account the multi-ethnic, multi-lingual, and multi-cultural diversity of the country. Abolition of all discriminations and oppression based on class, gender, nationality, region and caste and creating an inclusive democratic system and a just society is at the heart of all our struggles for decades. Thanks to the ultimate sacrifice of the thousands of martyrs of the historic People’s War of 1996 to 2006, People’s Movement of 2006, Madhesh Movement and many other oppressed people’s movements that we have come this far to lay the foundation of a new Nepal. We have to consolidate these historic gains and institutionalize them in order to establish sustainable peace, justice and prosperity to all. My government is fully committed to doing that with the conclusion of the peace process and the writing of a new constitution through the Constituent Assembly at the earliest. The constitution will not only guarantee the fundamental democratic norms and values. But it will also ensure that our multi-party democracy is inclusive, participatory and life-changing for all, especially the oppressed laboring masses and the marginalized ones. As it is rightly said: ‘The highest measure of democracy is neither the extent of freedom, nor the extent of equality, rather the highest measure of participation’, we want to institutionalize a really participatory democracy for all, particularly the downtrodden ones. Nepal’s foreign policy is based on fundamental principles of the UN Charter, non-alignment and Panchsheel principles and promotion of regional cooperation through SAARC. We would like to be a vibrant bridge between our two neighbours and beyond. At a time when humanity is so much in need of peace, and we all are striving for it, we particularly appeal for the development of Lumbini, the birthplace of the Buddha, as the fountain of world peace through effective international support and cooperation. The International Committee for Development of Lumbini needs to be reactivated at the earliest. Climate change has clearly emerged as one of the greatest challenges of the twenty-first century. Global warming has precipitated melting of snow in the Nepal Himalayas, a source of fresh water for over a billion people living in South Asia. Therefore, we have taken the initiative of promoting sustainable mountain agenda in order to highlight their special vulnerabilities and fragilities. The industrialized countries should bear greater responsibilities for this. Nepal strongly believes that regional mechanisms complement efforts to promote the global disarmament agenda. The Regional Centre for Peace and Disarmament for Asia and the Pacific (RCPD) located in Kathmandu would be instrumental in revitalizing the “Kathmandu Process” to facilitate dialogues and deliberations for confidence building in the region. We underline the crucial role of the United Nations in promoting international cooperation for development. Its role in shaping policy debate on and establishing global norms in economic and financial matters must be strengthened. 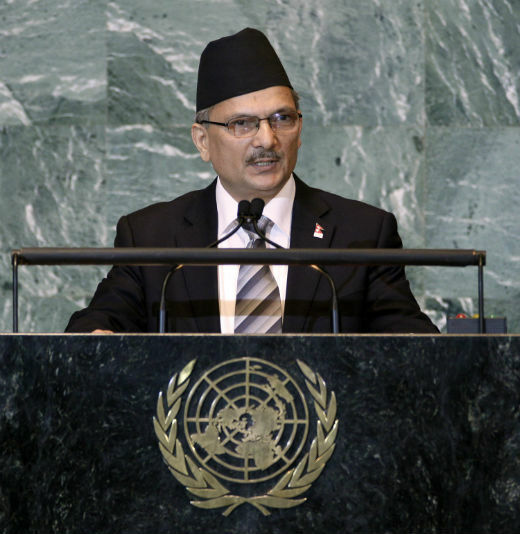 Nepal welcomes all efforts aimed at promoting system-wide coherence, including the operationalization of UN-Women.